Dimensions 646' by 104' by 33'5"
Torpedo protection depth was 20' (6.1m) and designed against a 740 lb (335 kg) explosive charge. 1942: Warspite upgraded to 15 20mm guns. Valiant arrived with Type 273, 281, and 282 radar and armament of 4x2 15" guns, 10x2 4.5"/45 dual-purpose guns, 4x8 2pdr guns, 10 20mm guns, and 4x4 0.50 machine guns. 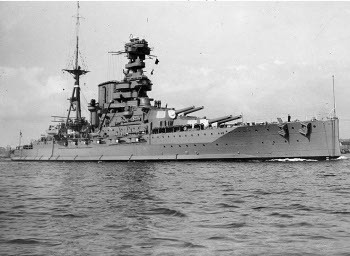 1943: Warspite upgraded to 16 20mm guns and catapults removed. Valiant added 6x2, 25x1 20mm guns and landed her machine guns and aircraft. 1944:-6 Warspite removed 6" guns, upgraded fire control radar to Type 274, and increased light antiaircraft to 4x2, 27x1 20mm guns. Queen Elizabeth arrived with armament of 4x2 15" guns, 10x2 4.5"/45 dual-purpose guns, 4x8 2pdr guns, and 4x2, 30x1 20mm guns. 1945: Valiant has light antiaircraft armament of 6x8, 5x4 2pdr and 16x1 40mm Bofors AA guns, and 7x2, 2x1 20mm guns. Queen Elizabeth has 20x2, 14x1 20mm guns. The Queen Elizabethswere completed during the First World War and were modernized repeatedly between the wars. They were armed with the superb 15"/42 gun, which was still untested when the First Lord of the Admiralty, Winston Churchill, took the considerable risk of ordering five ships armed with the new weapon. Churchill also ordered that the ships be designed to use fuel oil rather than coal. The ships were heavily modernized in the late 1930s and thereafter showed considerable variation in their armament, armor, and equipment. The ships gave good service during the Second World War. Warspite had the distinction of scoring the longest-range hit ever recorded for a battleship's guns in battle. Their greatest liability was probably their low speed compared with more modern battleships.